Walt Disney’s Alice in Wonderland is an adaption of Lewis Carroll’s children’s novels Alice’s Adventures in Wonderland and Through the Looking-Glass. The film tells the story of a young girl called Alice who, whilst on a riverbank, sees a White Rabbit in a waistcoat with a pocket watch pass by. Filled with curiosity, she follows the White Rabbit into a large rabbit hole which she falls down. Once in Wonderland, she meets a range of colorful yet completely mad characters, and we see Alice struggle as she tries to navigate around this beautiful yet bizarre place to find her way home. Alice in Wonderland is a wonderful film. Each character that is introduced is colorful and entertaining, each one of them has a role to play in creating the atmosphere and wonder of Wonderland. Whilst the songs in Alice in Wonderland aren’t as memorable as in other Dinsey films, they are still great songs that really capture Lewis Carroll’s vision of Wonderland. The performances given by the voice actors in this film are second yo none, they are some of the best performances given in a Walt Dinsey film, with a special mention for Kathryn Beaumont as Alice, who gave a mature and well-rounded performance despite her young age. Lewis Carroll’s original Alice stories are timeless classics which left Disney under a lot of pressure to deliver a film that would live up to the high expectations that Alice in Wonderland deserved. They didn’t disappoint. Wonderland is colorful, beautiful and at times haunting. It is filled with so many eccentric lovable characters from Tweedle-Dum and Tweedle-Dee, to the March Hare and the Mad Hatter. Each scene is as entertaining and as wonderful as the one before, there is never a dull moment in Wonderland. As an adult, the story of Alice in Wonderland affects me in a different way than it did when I was a child. Watching this film now reminds me of the imagination that I had as a child, and how as I grew up my imagination faded away. Watching the film now allows me to re-enter a world of imagination for just a short time and reminds me of the Wonderlands that I lost as I grew up. 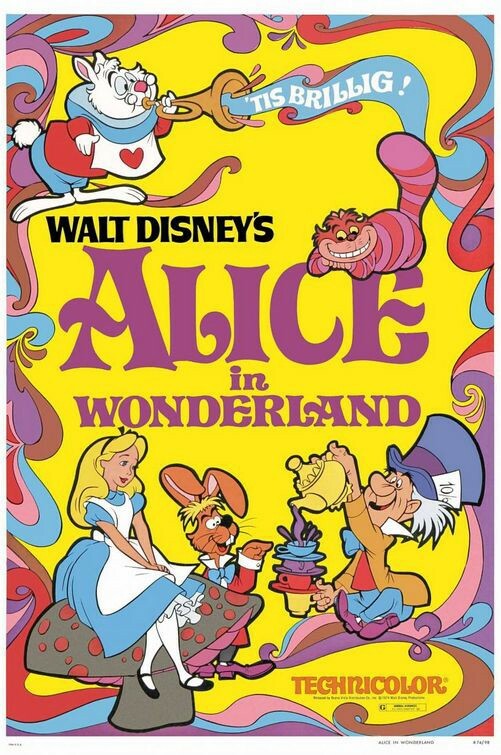 In my opinion, Alice in Wonderland is the best film that Walt Dinsey studios has ever produced.